“The Red Wheelbarrow” ends up being a useful lens through which to view the events of season two, as William Carlos Williams’ minimalist, ambiguous poem is about eliciting wonder, not offering an explanation. Williams doesn’t tell us what depends on that wheelbarrow, or why a small wheeled conveyance could make a difference. He leaves the solitary scene open to our questions, knowing the words don’t offer answers. The wheelbarrow could be the key to something important, like a journal containing all of Elliot Alderson’s thoughts. Or it could be utterly arbitrary, like a Chinese takeout menu, a worthless piece of paper that acquires critical value simply by scribbling some numbers in the margins. And if you’re trying to burn things, placing them in a wheelbarrow wet with rainwater will work against you. It all depends. So much depends. 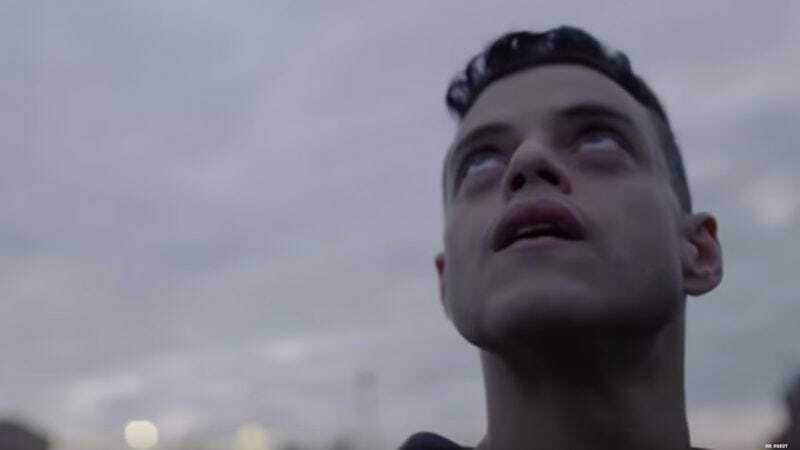 But for all the machinations and skullduggery littering the second season of Sam Esmail’s brainchild, it’s difficult to draw many conclusions about what it adds to the overarching story. When season one ended, the 5/9 hack had been executed, Evil Corp was reeling, Elliot had confronted the hat-wearing denizen of his mind, Angela had gone to work for the company that killed her mother, and Darlene just wanted to throw a party. Now we’re at the conclusion of another arc of this tale, and clues to the larger picture remain maddingly opaque. Elliot went to prison. Darlene was captured. The person whose story advanced the most this year—Angela—was nowhere to be seen this episode, save for a brief coda in which we learn she may have known this was going to happen to Elliot. We might be through the looking glass, as the Kraftwerk song (playing as Elliot and Tyrell entered the hideout) implies, but we haven’t been given a lamp. This world around us is dark, and only the most overt images can be glimpsed. So let’s take stock, and see what has happened. Darlene, on the other hand, is in free fall. Cisco was killed by the Dark Army assailant, after all, and even if Darlene survived, having someone’s brains splattered on you isn’t great for your emotional health. But her big realization comes from something we already knew: Tyrell Wellick is working with Elliot. The scenes between Darlene and Dom were mostly unsurprising, with Dom working any angle that might provide a way in to Darlene’s frazzled psyche. But in the end, her only real play was bringing Darlene into the fold, and showing her what the FBI knew. It was clever—by offering Darlene the one piece of information that might throw her, Dom created an opportunity to catch Elliot’s sister outside her rigid protective shell. It’s too early to know if it got Dom where she predicted—that by the end of the day, she and Darlene are “gonna be best friends”—but it’s a hell of a lot more than anyone else might’ve achieved. Dominique DiPierro: Lonely, yes. Stupid, not so much. Perhaps strangest of all, the other person who gets the most screen time in “pyth0n-pt2.p7z” is Joanna Wellick. Much like Dom, she must have some larger role to play in all this beyond waiting for Tyrell to show up again, because there’s absolutely no reason we’d be spending this much time following her around, were that not the case. Both she and we learn this week that it wasn’t her husband (sorry, soon to be ex-husband) sending her those gifts, but Scott Knowles, Evil Corp CTO and grieving widower of the wife Tyrell murdered. He delivers a monologue of pain and anger, doing whatever he could to lash out as the wife of the man who stole his, and Joanna absorbs it, an understanding look playing across her face. Then, she tells him how glad she is that his wife and unborn child were killed. Classic Joanna. It’s very within the realm of possibility that she goaded Scott Knowles into attacking her. Joanna isn’t exactly one to shy away from physical confrontation, and when she’s lying on the floor of Knowles’ home, struggling to breathe, bleeding profusely, the expression on her face suggests something beyond mere pain. But it’s hard to see where she goes from here. Sure, she can try and get the CTO accused of his own wife’s murder, but after that, everything is nebulous. She’s been on her own all season, with even Tyrell keeping his distance. It’s frustrating to think we’ll have to wait until next season to find out why she’s still such a major player in these events. It’s not just the FBI who prefers the python approach when it comes to Fsociety. Mr. 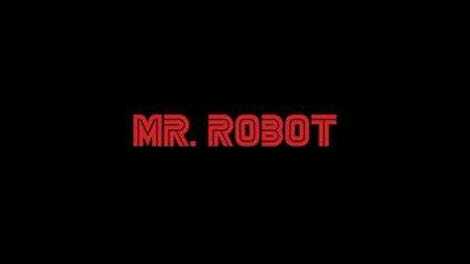 Robot plays the long game better than anyone, as was shown this week in the opening scene. Robot was ready to dismiss Tyrell, hopping into the car only as a courtesy. But even a courtesy call is curious behavior. Tyrell says he knows Elliot’s secret, the one that his nearest and dearest would be none too pleased to learn, and again, we’re offered yet another clue with no payoff in sight. Whatever Angela knows, there’s a good chance Tyrell knows it, too. It’s Elliot’s plan, but he’s seemingly the only one in the dark about it. Except for us, of course. As his silent partner, we’re also left wondering what’s being hidden behind all the elliptical communications and half-whispers of plans far greater. Whiterose’s big project involves consciousness, somehow. Something connected to the cosmos (Ecodelia, you may recall), and whether that something is a new form of cybernetics, or uploading consciousness directly to computers, or a new mental telepathy borne from some crazy sci-fi conceit, had yet to be determined. But there’s something afoot in all these oblique symbols and warnings, and the show is playing coy. That’s not a good thing, at this point. The season left viewers hanging in a way that I’m sure the producers thought would be eagerly anticipatory, but instead feels a bit like tap-dancing, distractions meant to elongate a story that is ready for a solid leap forward. Comparisons to season two of Lost aren’t out of the question. Still, Mr. Robot deals with story in a way few other series even dare approach. It’s akin to The Leftovers in its resolute denial of fan service, and willingness to explore any random alley, to see if narrative treasure might be uncovered there. Also, much like that show, there’s a surfeit of deep philosophical and existential themes running through the lifeblood of the series, and the questions it poses are almost certain to be more satisfying than the answers. It does have a tendency to drop ideas or concepts into a single episode, and then ignore them until it’s narratively convenient to pick them back up again. (See: the stuttered body swapping of Mr. Robot and Elliot, the incorporation of the viewer as another presence in the room, and so on.) It’s easy to give Mr. Robot the benefit of the doubt, because it’s proven worthy of that trust in the past. But stringing viewers along eventually becomes stringing viewers along, if you set up a bunch of dominoes and then refuse to knock them over. That’s the problem with the present: At some point, it becomes the past, and even Whiterose can’t stifle that temporal progression. This show offered up a hell of a lot of food for thought, this season. Just because it forgot the dessert doesn’t mean we’re leaving now. If you’d like to hear me get into the ideas and possibilities that were left unaddressed this episode, or just ask me questions about anything from all season long, I’ll be doing a Facebook Live discussion tomorrow morning at around 10:30 AM Central. Along with Josh Modell, I’ll delve into the finale, and anything relevant from the entire season, including any burning questions you want to ask us in real time by commenting as we go. I loved the sandwich-eating guy in the white protective suit who gave Tyrell and Elliot a lift in the elevator. I like to think he’s there still, just hanging out. Joanna’s boyfriend punches the wall, right in Tom Cruise’s face on the Cocktail poster. Along with the Young Guns poster on Cisco’s wall, the ’80s paraphernalia is strong this year, even discounting my Back To The Future theories. Dom, to Darlene: “You’re a lot more special than you think.” Tactic or truth? Okay, I have to ask: What was with the insane inside jokes about USA network, delivered by Dom’s boss while interrogating Darlene? The blue skies programming reference, the Burn Notice name check…was that all a weird wink and a nod to the show’s benefactor? Song check: When Darlene is walking through the FBI offices in slow motion, the track playing is a cover of Aimee Mann’s “The Moth” by the Les Deux Love Orchestra. Post-credits stinger: Mobley and Trenton, with the new identities, discussing a way they could make it as though all this had never happened. No idea what that means, but sure, it’s intriguing. And also an irritating thing to rub in our noses prior to waiting for season three. Thanks, everyone, for being such a wonderfully smart and engaged group of folks. I love this show, and even stumbles like tonight’s finale still contain multitudes of meaning, and it’s good to know you all are along for the ride. See you online, and until next season, let’s keep talking, no? Please—tell me you’re all seeing this, too.